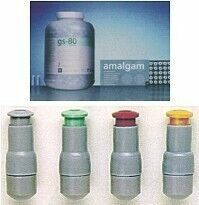 GS-80, The technically advanced, non-gamma 2 admix amalgam at an affordable price. GS-80's high strength and positive dimensional change ensures longevity and patient satisfaction. Over 200 million successful GS-80 restorations have been placed since its release worldwide in 1986. GS-80's consistent mix, ease of loading, placement in preparations, condensability, burnishability, quality of interproximal contact, carvability, and setting characteristics ensure the final restorations meet the needs of the operator. GS-80's high compressive strength minimizes the risk of fracturing the restoration.- 1 High compressive strength ensures a tough and durable long lasting restoration. GS-80's positive dimensional change ensures excellent sealing qualities at the margins.- 1 Negative values can contribute to post operative sensitivity.